Lymington Fields is a cutting-edge, contemporary design in the east London suburb of Dagenham. 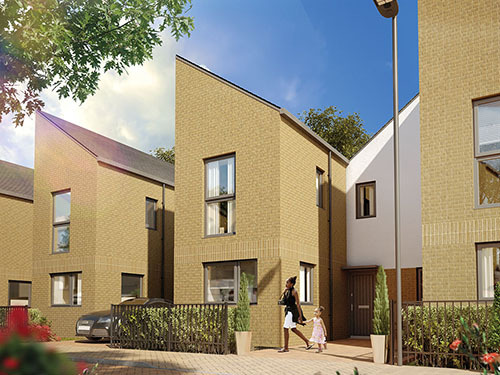 Home Group is delivering the affordable homes in partnership with Lovell Homes, offering 112 affordable rented and 47 shared ownership, one and two bedroom apartments and two and three bedroom houses. The vision for Lymington Fields is clean, green and a highly sustainable community, where families can flourish and grow. The light, spacious, high-standard family homes all have attractive exterior designs, providing a cosy contemporary living environment. All are Lifetime Homes compliant and some are wheelchair adaptable, truly reflecting a lifetime home for residents, who will be able to grow older in a home that will adapt to their long-term needs. Our scheme is pivotal in providing an affordable opportunity for customers to step on to the property ladder, making the dream of home ownership an achievable aspiration.